Life insurance has often been seen only as a tax saving instrument in India. But it plays a much bigger role for both, individuals and the nation as a whole. Visitors to the webpage of Life Happens – a non-profit organisation promoted by US life insurers – will find videos of beneficiaries explaining how life insurance can be a godsend. Their accounts are supposedly based on real life experiences, and you would not be faulted for dismissing them as an industry-driven commercial initiative, to make people buy more life insurance. However, the fact remains that a life insurance plan does provide a safety umbrella – offering more than one benefit. Broadly, it provides life protection and maturity proceeds, unless it is purely a term plan. In a spin-off, this is not only beneficial at a personal level, but adds to the national GDP as well. The social impact of life insurance cannot be emphasized enough. Millions of families have indeed benefited from a fundamental principle of a life insurance plan; that is, it can be utilised according to the policyholder’s unique needs, ensuring a financial leg-up for him or her. The plan can be used as a second income over the family’s primary one, thereby improving the policyholder’s lifestyle, or in the case of a one-time pay out after maturity, used for just about any purpose. Life insurance eventually builds up a cash amount that, if not claimed as a death benefit, can be withdrawn during specific needs. This creates a kind of forced savings plan. An ideal life insurance plan can give a person both, insurance cover and an investment. It can help enable savings – i.e. enables wealth creation over a period – and provides security. It is also the only investment tool that provides customised plans for different stages of the policyholder’s life. Plus, it helps in tax saving. The insurance sector – especially life insurance – not only provides a social security net in developing economies, but it also contributes to the GDP of both, emerging economies (like India) and developed ones (like the US). For instance, according to the Insurance Information Institute – an industry-promoted non-profit in the US – the contribution of life insurance segment to India’s GDP in 2016 was almost 3%. According to the same institute, in 2015, American life and health insurers invested $2,734 billion in bonds, accounting for almost 74% of their total investments. (In 2013, it was almost 75%). As the bond market’s principal objective is to provide a mechanism for long-term funding of public and private projects – like developing road infrastructure or a company expansion – what this means is that investments by life insurers has a direct role in nation-building. The world’s first insurance company was established in 1667 – after the Great Fire of London the previous year – when a law was passed for the incorporation of an organisation to indemnify for losses due to fire. According to the Encyclopaedia of American Business History, life insurance in the US started off as a welfare tool in 1759, when the Presbyterian Synods in Philadelphia and New York set up the Corporation for Relief of Poor and Distressed Widows and Children of Presbyterian Ministers. As subsequent events show, it had far-reaching socio-legal consequences. The American life insurance sector has had a positive impact on the devolution of greater economic rights for women – by initiating a process that led to pro-women’s Acts. In the 18th century, although life insurance companies in the US claimed women and children as their main beneficiaries, women were prevented by law from enjoying the offered insurance protection if their husbands died. This was because of two major hurdles. First, in the eyes of the law, familial ties (including that between husband and wife, or parent and child) were not considered “adequate evidence” of insurable interest. Insurable interest implies that any person taking out insurance on the life of another should have specific monetary interest in that person’s continued life. Apparently, at the time, a woman was seen as having no monetary interest in her husband being alive. Secondly, married women could not take out life insurance policies as the law forbade them to enter into contracts on their own. And as a way out, married men began to take out the policy in their names, nominating their wives or children as beneficiaries. But as the law also considered an insurance policy an integral part of a man’s estate, creditors could claim its benefits on his death. This negated the policy’s very purpose. Subsequently, a campaign was launched to get life insurance policies protected from creditors’ claims – a watershed moment in the history of women’s rights. The New York Life and Trust led the campaign to get a state law passed on April 1, 1840, which spelt four breakthroughs in terms of women’s rights. • Second, the law stated that the policy would be “free from the claims of the representatives of her husband, or of any of his creditors” if the annual premium was less than $300 (roughly the premium for a $10,000-policy on the life of a 40-year-old). • Third, in case she (the policyholder) died before her husband, the policy reverted to the children, who were granted the same protection from creditors. • Finally, women no longer had to prove their monetary interest in the life of their (insured) husbands; this was the first time that insurable interest was made independent of monetary interest in the life of another. The state of Maryland passed an identical law before the year ended, and four years later, Massachusetts followed with tighter norms. But New Jersey topped the others in 1851, capping annual premiums at $100. Where similar laws did not exist, courts often went by the New York statute. When the insurance business spread to other parts of the world, these principles were a given. Related: Are guaranteed life insurance plans worth buying? Meanwhile, about 75 years before life insurance became accessible to women in the US, another concept had taken take roots in far-off England: that of Mutual Life Insurance. The Society for Equitable Assurances on Lives and Survivorships of London – today known as the Equitable Life Assurances Society – introduced the concept in 1762 when it was set up. Under this, profits were shared among ordinary policyholders rather than proprietary stockholders – profits being the excess of invested premium income over death payments. The redistribution was usually in the form of reduced premium payments, which decreased the pay-out burden on policyholders. By the 1840s, it had become a reality in the US as well; its rise triggered by the financial crisis of 1837 that hit investments in infrastructure (e.g. railroads) and the financial sector (including life insurance). But mutual life insurance, on the other hand, required little initial capital, as the pay-out for any death claims came from the premium payments from high-volume sales. As a result, it quickly became the investors’ choice, with nearly 20 companies coming up by 1850. It also appealed to policyholders because it created wealth for them. While earlier they could not afford to own stock in a proprietary insurance company, they could now share profits of mutual life insurance companies. Thus, the concept of life insurance schemes also being an investment tool started gaining popularity among the working masses. According to a recent study by McKinsey & Co, life insurance has fared “better” in emerging markets, despite losing ground to alternative savings schemes in mature markets. In fact, McKinsey says the global growth in the life insurance sector will be spearheaded by four of the five BRICS markets – Brazil, Russia, India and China. OECD (or the Organisation for Economic Co-operation and Development), a body of the more developed economies such as the US and the UK, explains why life insurance is faltering in mature markets. “The growth of non-life gross premiums in 2015 was driven in some countries by growth in the motor vehicle insurance market as the number of policies and number of cars in circulation increased,” says the 2016 OECD report on the sector’s global trends. In other words, in a market where social security is strong, the tilt is towards non-life areas like auto insurance, as opposed to markets like India, where it is relatively weaker. EY, formerly Ernst & Young, sees India as the driving force in “Emerging Asia’s” insurance market, comprising both life and non-life segments. (It excludes China from the list). 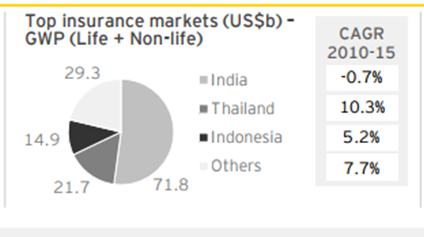 In its Global Insurance Trends Analysis 2016 report, EY shows India enjoying a massive 71.8% of the life and non-life segments. It was followed by Thailand (21.7%) and Indonesia (14.9%) as single entities with any sizeable share, with the remaining 29.3% being accounted for by “others”. Where does insurance stand in India? As mentioned earlier, the life insurance sector accounts for 3% of India’s GDP. But the social security net that it throws over vast multitudes is also crucial. Recognising this, Prime Minister Narendra Modi has launched a life insurance scheme for the poor, called the Pradhan Mantri Jeevan Jyoti Bima Yojana.